It’s cold. Too cold to contemplate even sticking my nose out of the sleeping bag. Procrastination sets in. Another 5 minutes. Alpine starts.This job’s only evil. We are at 5,200m in a broad glacial valley called Island Peak base camp. Surrounding me once again are 2 Irishmen; one young buck and one old buck, a crazy Scottish girl, an ex-SAS soldier and a vertically savvy London businessman who is combining this adventure with climbing Ama Dablam. It’s time to stop the procrastination and start gunning for the summit of Island Peak. The usual flapping: clothes, gloves, harnesses and plastics. Then at 03:00 we are off. We lose ourselves climbing steep rocky slopes and as per usual no-one talks. It’s a slow pace as each of us gets busy picking their way up the occasional scrambly bit. The sunrise brings total stillness. A quiet that can only be achieved in the bitter Himalayan air. There’s not a breath of wind and the mountains around us exchange one subtle pastel colour for the next. I am definitely counting this moment as a job highlight. As we reach the glacier my Scottish friend and the Soldier decide to descend. 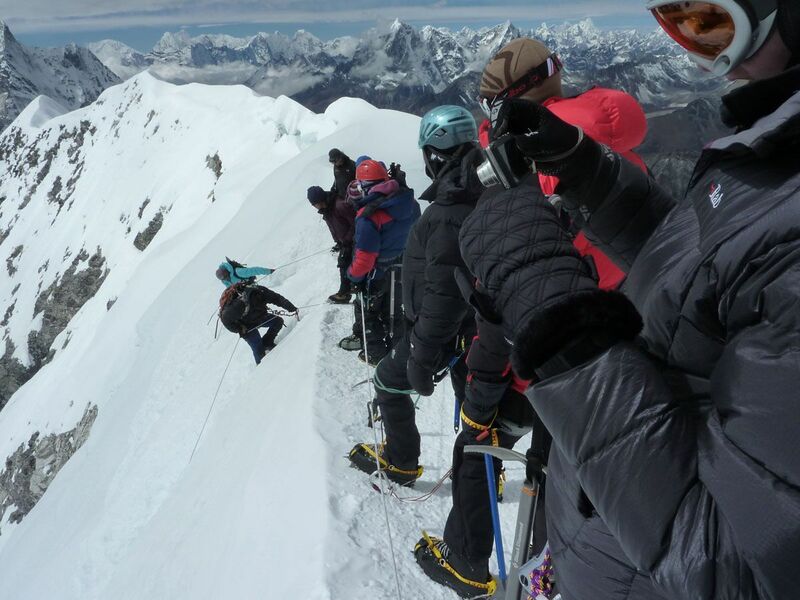 The climb so far has already been too much for them and the unknown quantity of glacier travel and the steep head-wall guarding Island Peak’s summit is beyond them today. My two friends descend knowing that Island Peak will wait for them should they wish to try again. This is one of the great things about mountains: they can’t run away. For the rest it’s up. And the temperature goes up as we go up. Still no wind and the glare of the glacier coupled with the rising temperatures brings about that lovin’ microwave effect. We stop to take off all those layers and apply another layer of sun-protection. We’re all still moving strong when we cross the glacier and reach the head-wall. A quick breather and we clip into the fixed line and start jumaring up to the summit ridge. I go ahead to film the guys climbing up below. In the lead is Irish Jerry, 65 years old. It’s his first time at altitude, his first time on a glacier, his first time jumaring , his first time in Nepal, his first time camping, his first time on an expedition – despite these impressive firsts he is going strong. I reach the summit ridge and wait for the others to catch up. The home run lies before us: conditions are perfect and there is no stopping us. When Jerry reaches me I let him pass to summit first. Slowly he huffs and puffs to the top of this beautiful 6,000m Himalayan summit. When he can climb no higher he triumphantly stretches his arms into the air. The moment is caught on camera and I shout until I am hoarse. What a great moment!! What a cool achievement!! And you know, once again I think back to those words of that Aussie climbing superstar. He sure had that one right!